I believe that the 10 year anniversary of 9/11 falling on a Sunday is no accident. Those events are forever seared in our collective consciousness. 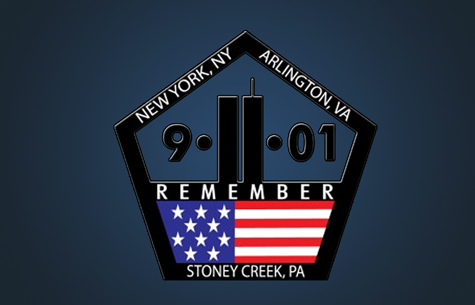 The 10th anniversary of these events falling on a Sunday allows the Church to help people remember, find hope, and cast a light into this dark world in which we live. Today at Journey, we remembered along with the world how our world changed in an instant that clear fall day. Our remembrance today was very moving. It was a very different Sunday than what we normally have. We began by giving everyone a red, white and blue ribbon to wear as they entered. The lobby was filled with mellow music and images. We intentionally chose images not of the attacks or the tragedy but of the humanity and heroism of that day – images of flags, candlelight vigils, and firemen. 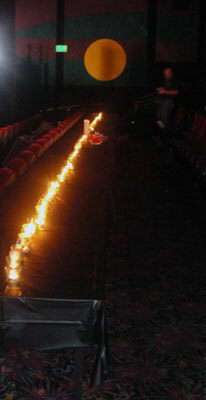 In the auditorium soft music was playing (actually, it was the soundtrack from the movie World Trade Center), the lights were turned down and we had a row of tables across the front lined with candles with just one candle lit. The service began softly instead of our usual upbeat beginning. We shared a great video to move into the time of remembrance. Following the video, we invited everyone forward to light a candle in honor or remembrance of someone who lost their life or gave it in the line of duty. It took several minutes in silence to light all the candles. We followed the candle lighting with a moment of silence, a prayer and a song. The message was one focusing more on hope than remembrance. We must remind ourselves that in all the 9/11 moments of our lives, God is there, God is still God and we are not alone. Today was a different kind of Sunday, but one that I hope had as much meaning for everyone there as it did for me. All of the 150 candles after the service. This blog is part of the Sunday Setlist Blog Carnival over at TheWorshipCommunity.com. See what other churches did on this day of remembrance. love your intentionality Matthew and creating a different kind of space and environment to help remember the events of 9/11 in the context of worship and faith.